The following services have a charging point for electric vehicles. Further details on each of the services can be found by tapping it's name, however you would prefer to go to Services Search and tick the 'electric vehicle charging point' box, as it will allow you to further customise the search. 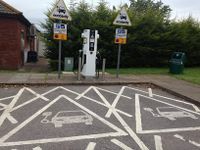 In 2017, the electric vehicle charging points were made mandatory at motorway services, but since 2007 they have been widespread. Most are provided by Ecotricity, although Welcome Break and now Moto also have Tesla Superchargers. Pages in category "Electric vehicle charging points"